Lord Hobo Brewing Boom Sauce Double IPA: Brewed in Woburn, Massachusetts this double IPA is a blend of three of their hop forward ales: Blend of Ball and Biscuit, Steal This Can and Consolation Prize. It comes in a 500mL can, simply labelled Boom Sauce, and it makes for a great shelf impression and presence amongst a crowded craft beer market. 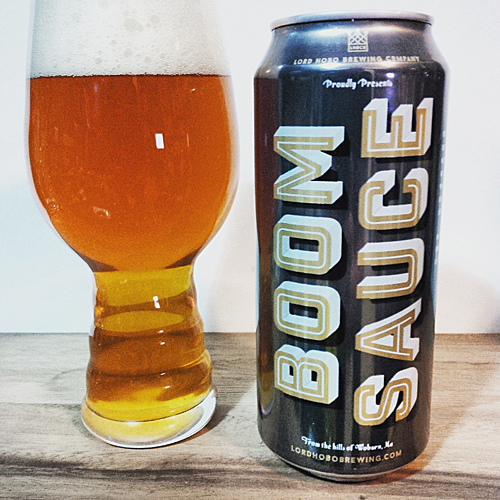 Boom Sauce is a great design example, something attention grabbing, simple and thankfully filled with delightful beer too. I think a lot of people in the beer world could benefit from design expertise like this, and smartly they trademarked it too! Aroma and Appearance: It pours a clear copper colour with two fingers of foam and an above average level of carbonation for the style. The aroma is full of caramel sweet doughy malt, grapefruit citrus and a plethora of passion fruit, gooseberry, lychee and strawberry notes. Flavour: Boom Sauce starts our with a classic bready malt and grapefruit rind beginning that moves into a lovely chewy dough and caramel combo in the middle that lingers for awhile. Eventually, a peach skin flavour and rindy texture takes over showcasing flavours of lychee and gooseberry with hints of nectarines and a slightly bitter aftertaste. Overall Impression: I personally love Double IPA’s with doughy caramel middles, it’s such a unique and tasty quality in a beer when done right and this one nails it. It’s a cool idea to blend existing ales, I wish more places would do this! Rating: Excellent at 8.5/10, a nice overall blend of hop forward ales that isn’t overly bitter and delivers a nicely balanced flavour profile. Food Pairing: This would pair up well with some Swedish Meatballs and Lingonberry sauce (you know the Ikea ones!). Check out this picture below from their Facebook Page, I love the massive stack of cans pictured here for some reason. It would pair well with Swedish meatballs or my fridge. Looking for followers to donate a can as I can find Swedish meatballs lol. Ok fine I will just live vicariously through your review lol.